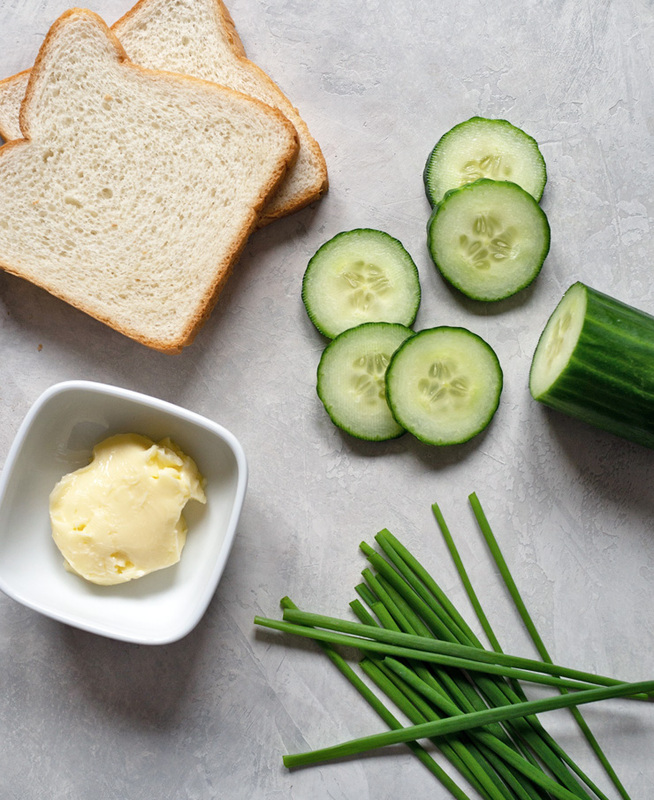 Traditional cucumber sandwiches for tea consists of crustless bread, cucumber, and butter. That’s it. All other cucumber sandwiches are variations off of these three basic ingredients. A cucumber sandwich is a tea time staple, and for good reason–it’s light and dainty. Two rules I always follow when making tea sandwiches are: that they should small enough that they can be eaten in 2-3 bites, and they are prepared so you can eat them with your fingers and won’t make a mess. This cucumber sandwich definitely follows the rules. Afternoon tea started when a Duchess in England wanted a light meal to sustain her between lunch and dinner. A cucumber sandwich with just bread and cucumber is perfect since it’s not heavy nor too filling. 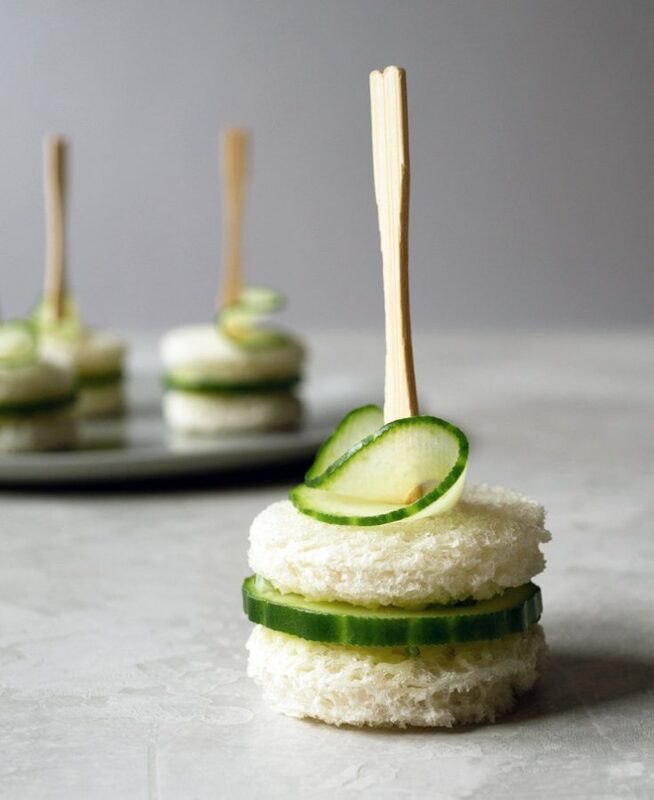 My cucumber tea sandwiches are made just a little special with chive butter and decorated with a paper thin slice of cucumber folded and held together with a cocktail fork. And they’re freaking adorably round. 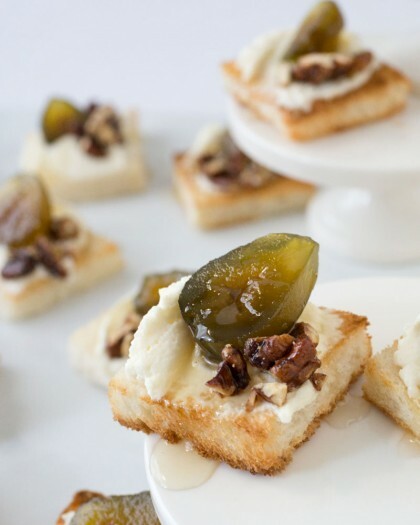 These cucumber sandwiches are not just perfect for afternoon tea but are great to serve at parties as elegant small bites and appetizers. It’s a cute little thing that keeps the top folded cucumber in place. I can’t make my tea sandwiches without this cookie cutter set. I use it ALL THE TIME. Gets me perfectly even slices of cucumber. Slice cucumbers using a mandoline slicer so that each piece is the same size. Blot cucumber slices with paper towels. Make chive butter by mixing chives and salted butter. Cut white bread into circles using a cookie cutter. Make sure to keep the size of the circle to be as close to size of the cucumber diameter. 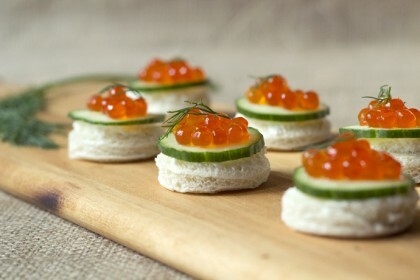 Assemble by buttering sides of bread circles and sandwiching them between a slice of cucumber. 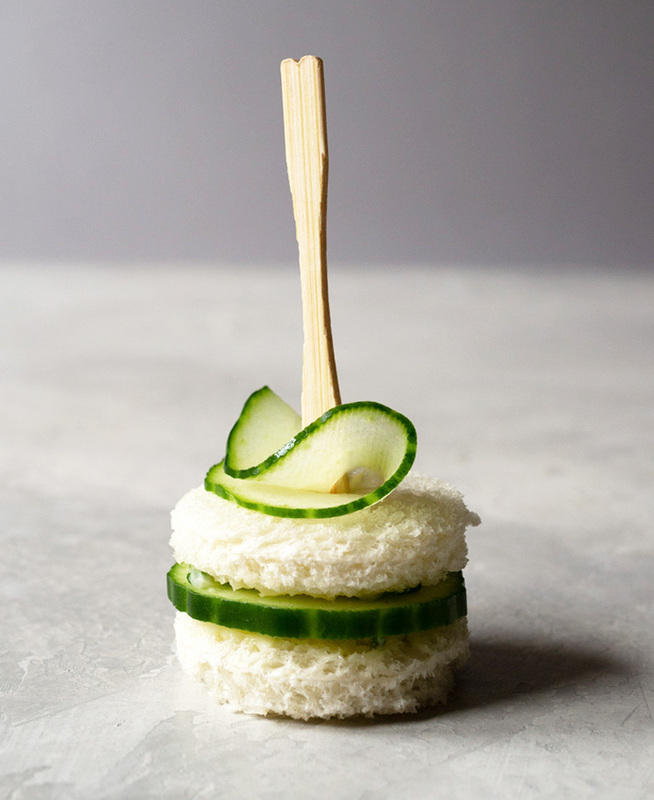 Garnish with a paper-thin slice of cucumber skewered in place with a cocktail fork. The best cucumbers for sandwiches are English. 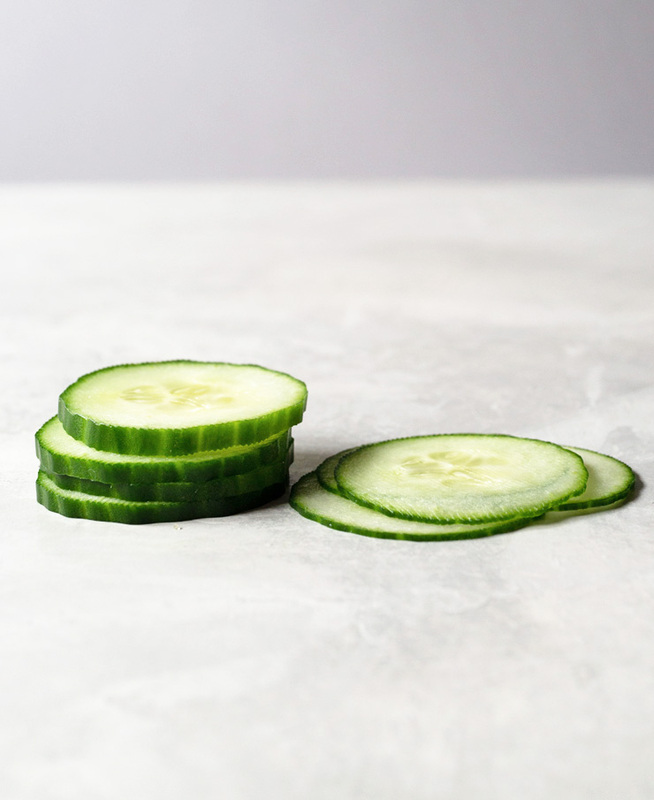 Yup, English cucumbers, also known as “hothouse cucumbers”, are ideal since they have fewer seeds than other cucumbers with a thinner skin which means you don’t have to peel them. They sell them individually wrapped in plastic. Most afternoon tea cucumber sandwiches are cut paper thin but for my version, I made them slightly thicker so they have a nice crunch. For this recipe, the cucumber needs to be cut into two different thicknesses. So instead of trying to eyeball it with a knife, I used a mandoline which gave me perfect slices. The thicker slice, set to 1/8″, goes in between the bread. The thinner slice, set to the thinnest mandoline setting, is used as a garnish on top of the sandwich. The circumference of your cucumber (try saying that three times fast) is the deciding factor in how big your tea sandwiches will be. I have a round cookie cutter set where I try out a couple of sizes to see which one fits the cucumber best. 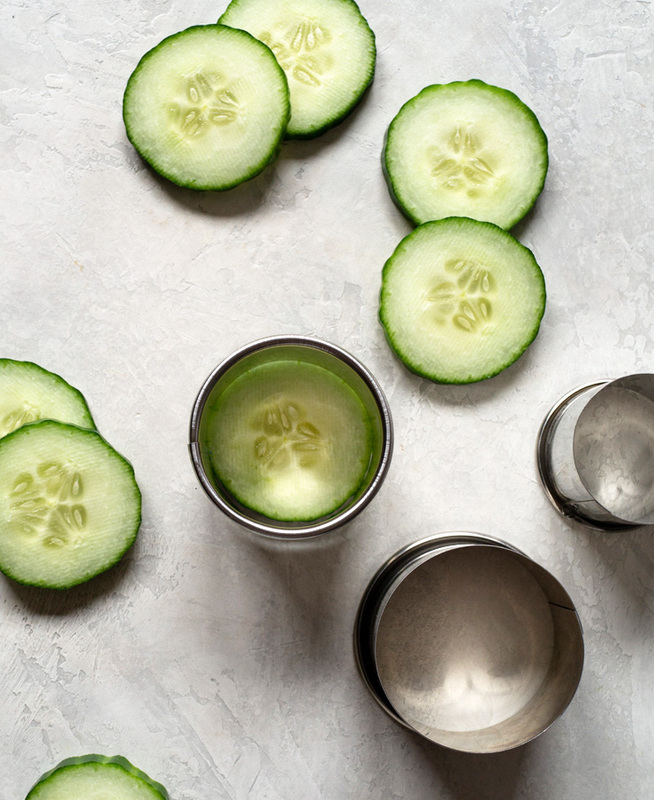 The cookie cutter doesn’t need to be exactly the size of the cucumber, but try to find the closest match. The worst cucumber sandwiches are the slimy ones. You know, the ones that slide around between the bread slices. GROSS. How do prevent this? Paper towels. After slicing the cucumbers, place them flat on paper towels and blot to make sure they’re dry. Softened butter is the key. It makes it easy to mix in the chives and to spread it on the bread. The chive butter does double duty in this recipe. First, it creates a layer between the cucumber and the bread to keep the bread from getting soggy. Second, the chives add a fresh and bright taste to the boring cucumber. If you know any Koreans, you know they love scissors in the kitchen. I think we use scissors as much as we use knives. I used my trusty scissors to cut the fresh chives into little tiny bits. 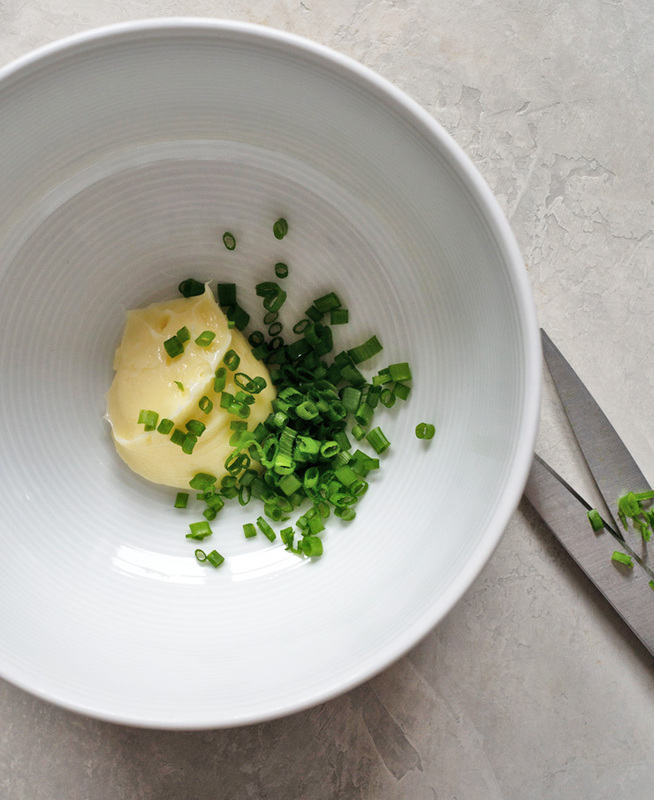 Mix the butter and the chives together and you’ve got…chive butter! 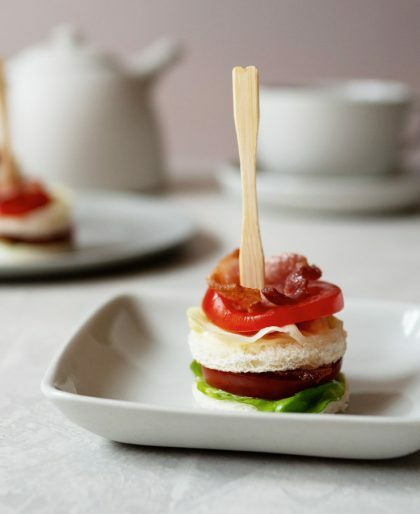 For my BLT tea sandwiches, which have a similar look to these tea sandwiches, I used very thin bread. But, since these only have one layer of cucumber, I went with regular white bread. You’ll see most traditional cucumber sandwiches are rectangular or triangular in shape, but I went with a circle for mine. Each slice of bread will give you two circles for each tea sandwich. Avoid the crust when cutting out the bread. We’re not savages. 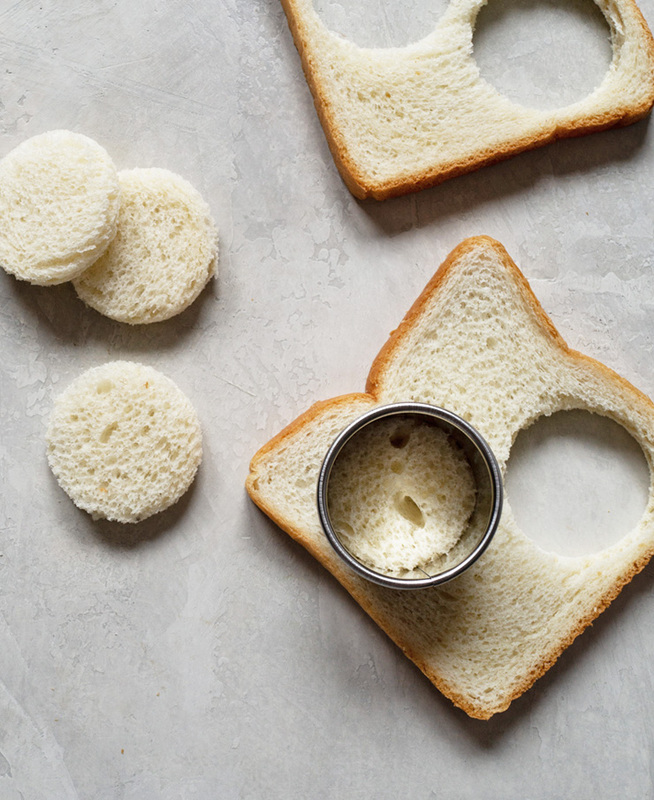 To prep this ahead of time, the bread can be cut into circles beforehand and kept in the refrigerator between damp paper towels to prevent them from drying them out. Once all the ingredients have been prepped, we’re ready to assemble! On the cut out round bread, spread on a little chive butter making sure to get an even coat. Place the thicker slice of cucumber on top. Butter one side of a piece of bread and place that on top of the cucumber with the butter side down. The butter is acting as a barrier between the bread and the cucumber. Gently fold the thin cucumber slice in half from the center and skewer the folded side into the tea sandwich with a cocktail fork. Since a cucumber sandwich is so light, any tea will go well with it from white tea to black tea. Green tea and black tea especially go well with cucumber sandwiches. The slight astringency from the green or black tea will balance well with the buttered bread. I would recommend a classic like Earl Grey for black tea and Sencha for green tea. To prevent the bread from getting soggy, make sure the cucumber has been patted dry and each side the cucumber touches should be buttered. The chive butter acts as a barrier. You can make the sandwiches 24 hours in advance and store in the refrigerator in an airtight container. Use wax paper and a damp paper towel on top of the sandwiches to keep the bread from drying out. You can use whatever kind of bread you like, but make sure it is pillowy soft which contrasts perfectly with the crunch from the cucumber. Cut frozen bread if you want cleaner cuts on your tea sandwiches. Dainty and easy-to-make cucumber sandwiches with chive butter. 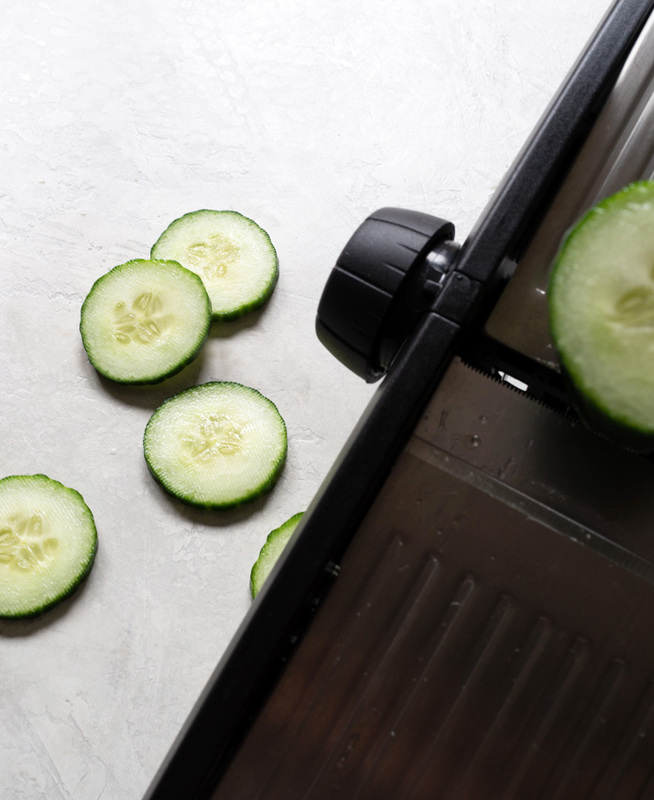 Use a mandoline slicer to cut cucumber into two sizes -- 1/8" and one at the thinnest setting. Get 4 slices of each size. Dry sliced cucumbers with paper towels. Mix softened butter and minced chives together in small bowl. Find a cookie cutter that is the same circumference as the sliced cucumbers and cut eight circles out of the bread. Avoid cutting the crust. To assemble, butter one side of bread and top with the 1/8" cucumber slice. Butter another piece of bread and place on top of cucumber, butter-side down. This is so bento-box style that I'm going to add to my list of ideas for a preschooler's lunch. Hi notesontea, that's a great idea! Thanks, Michele! Yes, SUPER simple! Is it better to use unsalted or salted butter? Hi Katy, since salt isn't added at any point, I would suggest salted butter. Chives. Scallions will be too strong. Hi Heather, I didn’t put exact ingredient measurements or portion sizes for this since it’s an idea for a tea sandwich. How much butter and chives do you use? Hi Cheryl, I just eyeballed it and didn’t write down the amount used unfortunately. Hi Jan, yup, I used fresh chives. Love the idea of tea sandwiches, however I’m not a fan of butter. I substituted cream cheese instead. Worked wonderfully. Rave reviews. Unsalted butter works just as well. (I made this today!) The chives give such a great flavor in combination with the cucumber, you may not miss the taste of salt at all! Hi Jeni, happy to hear it turned out well! Good to know about the unsalted butter. I’m trying this for a wine party I’m having…will update! Hi Jule, oooh, perfect for a wine party! Let me know how everyone liked the tea sandwich! 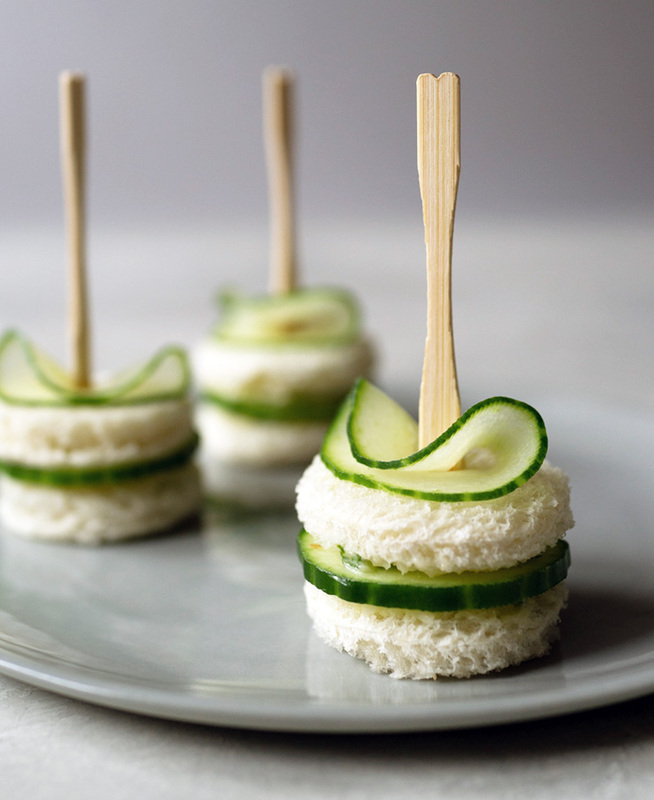 Your Cucumber Tea Sandwiches was a great hit at my Christmas Tea Party! Thank you so much for sharing. Hi Gail, I’m so happy to hear it was a hit!! What a lovely idea to have a Christmas Tea Party! What are the quantities/measurement for each ingredient? Hi Alicia, I’ll be reworking this this fall so it shows the quantities for each ingredient. As of now, it’s an afternoon tea sandwich idea. I gave this recipe a try with what I had at home. I used unsalted butter and added some salt and used a bit of cream cheese. I loved it!!! Thanks a lot. Hi Kika, oooh, nice addition with the cream cheese! Hi Gale, love the variation! Sounds lovely! I use rye bread, cream cheese mixed with a package of the dry hidden valley salad & dip mix! Hi Pat, nice twist to a classic!